In my article about Angel Magic I very shortly compared the Steganographia of Trithemius with the second book of the Lemegeton: Theurgia/Goetia (T/G). In this article I will make a slightly closer investigation of the differences and the similarities of the two writings. For this purpose I used the Latin Steganographia and the English T/G from Esotericarchives.com and the translation of the T/G by S.L. MacGregor Mathers that can be found online on several pages. Later I also checked the English translation of the Steganographia by Adam McLean (it is still available, but very expensive, so I went to the Bibliotheca Philosophica Hermetica to see it). Comparing the two writings it becomes very clear that Trithemius used the older writing as basis for his own work. Not only the names of the angels, dukes, etc. are almost always roughly the same, but even the order corresponds mostly. 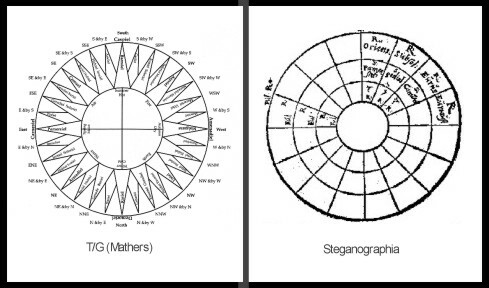 T/G has several stars over eachother, this is clearer in the diagram in the Esotericarchives-version. This doesn’t really matter, because the order the angels, etc. are treated in, do not really follow the star anyway. In the ‘top star’ of the T/G-diagram you can find the names Barmiel (south), Uriel (sw), Malgaras (w), Usiel (nw), Rasiel (n), Armadel (ne), Pamersiel (e) and Camuel (se). The order of the book T/G is as in the table below. There are 4 emperors, 16 chief spirits and 11 wandering dukes. Trithemius is on the right. I shove a bit with the tables, because Trithemius first treats the spirits, then the emperors and then the wandering dukes. Now you have the same names on the same lines. The names between Trithemius and the T/Gs that I used differ, but this is also the case between the two T/Gs. Both books give some information about the emperors, spirits and dukes. This information is for example, how many spirits of the day and night the treated entity rules over. Most of the time, the numbers correspond. They do not with Padiel (Trithemius has 10x as much spirits of the night). The next part of the information are tables with the names of spirits under the command of the treated entity. T/G not only gives the seals of the emperor, chief spirit and duke, but also of the spirits under their command. Trithemius has no seals whatsover, he only refers to them sometimes. The tables do always correspond in number, even in division, but the names sometimes differ, sometimes a lot too! For example with the spirits under command of Asyriel we have “Astor” with Trithemius and “Alitors” in T/G, “Cusiel” vs “Cuopiel” and “Malqueel” vs “Malugel”. After this follow the conjurations. In T/G they are almost all the same, with Trithemius there is something completely different going on. After the conjuration T/G goes to the following entity, but Trithemius gives much, much more information including a second spell. Trithemius had a different idea with his Steganographia: you summon a spirit, give him an encrypted message, the receiver gets a letter from you and then summons the same spirit and receives the encrypted message. The summonings are examples and codes for different kinds of encryptions, but still you get two of them, one spell for the sender, one for the receiver. Here I give all summonings without further comment. People who like to try to decipher them here have all the codes. Parmesiel (I know) is every other letter of every other word. See my Angel Magic article for this. Looking over the names, you can at least see immediately that Trithemius followed the order of the T/G. The differences in names can possibly be caused by Trithemius having another (older) version of the text, but for the rest, there can be little doubt for his ‘inspiration’. Trithemius -though- adds some information, about the entities: good or bad, only for advanced magicians or also for beginners, how they should appear; what kind of letters you should send to the receiver, sometimes how to act when an entity appears, etc. And here follow the summonings from the Steganographia. Sometimes they are right in the text, sometimes marked. When it doesn’t say anything between <broken brackets>, I had to find the code myself, since it was right in the middle of the rest of the text. Two times the codes are printed in red, so I suppose it is the same in the original. At other times Trithemius bluntly says “coniuratio” (conjuration) or “carmen” (song) before giving an encrypted line, this information is added between the broken brackets. Pamersiel oshurmy delmuson Thafloyn peano charustea melany, lyaminto colchan, paroys, madyn, moerlay, bulre + atloor don melcour peloin, ibutsyl meon mysbreath alini driaco person. Crisolnay, lemon asosle mydar, icoriel pean thalmõ, asophiel il notreon banyel ocrimos esteuor naelma besrona thulaomor fronian beldodrayn bon otalmesgo mero fas elnathyn bosramoth. Padiel aporsy mesarpon omeuas peludyn malpreaxo. Condusen, vlearo thersephi bayl merphon, paroys gebuly mailthomyon ilthear tamarson acrimy lon peatha Casmy Chertiel, medony reabdo, lasonti iaciel mal arsi bulomeon abry pathulmon theoma pathormyn. Padiel ariel vanerhon chio tarson phymarto merphon am prico ledabarym, elso phroy mesarpon ameorsy, paneryn atle pachum gel thearan vtrul vt solubito beslonty las gomadyn triamy metarnothy. Camuel aperoys, melym meuomanial, casmoyn cralti busaco aeli lumar photyrion theor besamys, aneal Cabelonyr thiamo vesonthy. Camuel Busarcha, menaton enatiel, meran sayr abasremon, naculi pesarum nadru lasmõ enoti chamabet vsear lesponty abrulmy pen sayr thubarym, gonayr asmon friacha rynon otry hamerson, buccurmy pedauellon. Aseliel aproysy, melym, thulnear casmoyn, mauear burson, charny demorphaon, Theoma asmeryn diuiel, casponti vearly basamys, ernoti chaua lorson. Aseliel murnea casmodym bularcha vadusynaty belron diuiel arsephonti si pa normys orleuo cadon Venoti basramyn. Barmiel buras melo charnotiel malapos veno masphian albryon, chasmia peluo morophon apluer charmya noty Mesron alraco caspiel hoalno chorben ouear ascrea cralnoty carephon elcfor bumely nesitan army tufaron. Barmiel any casleon archoi bulesan eris, Casray molaer pessaro duys anale goerno mesrue greal cusere drelnoz, parle cufureti basriel aflymaraphe neas lo, carnos erneo, damerosenotis anycarpodyn. Gediel asiel modebar mopiel, casmoyn, rochamurenu proys nasaron atido casmear vearsy maludym velachain demosar otiel masdurym sodiuiel mesray seor amarlum, laueur pealo netus fabelron. Gediel aprois camor ety moschoyn diuial palorsan, fermel, asparlon Crisphe Lamedon ediur cabosyn arsy thamerosyn. Asiriel aphorsy Lamodyn to Carmephyn drubal asutroy Sody baruchõ, vsefer palormy thulnear asmerõ chornemadusyn coleny busarethõ duys marphelitubra nasaron venear fabelronty. Aseriel onear Camersin, Cohodor messary lyrno balnaon greal, lamedõ odiel, pedarnoy nador ianozauy chamyrin. Coniuratione expleta sicut oportet missus spiritus nebulatenus apparebit. Dictoque verbo mystico veritatem loquetur ad aurem, & omnia quæ sibi fuerant commissa fideliter intimabit. Nullus tamen circum sedentium sentiet quicquam: modo tu constans & imperterritus, sicut oportet, perseueres. Maseriel bula~ lamodyn charnoty Carmephin iabru~ caresathroyn asulroy beuesy Cadumyn turiel bulan Seuear; almos lycadusel ernoty panier iethar care pheory bulan thorty parõ Venio Fabelronthusy. Maseriel onear Camersin, Cohodor messary lyrno balnaon greal, lamedõ odiel, pedarnoy nador ianozauy chamyrin. Malgaras ador chameso bulueriny mareso bodyr Cadumir auiel casmyo tedy pleoryn viordi eare viorba, chameron vest thuriel vlnauy, beuesy meuo chasmironty naor ernyso, chorny barmo caleuodyn barso thubra sol. Coniuratione dicta sis vir fortis & constans: apparebunt tibi statim visibiles quos vocasti. Quod si vocato ex nocturnis non statim venerint: non propterea intermittas opus tuum: sed vrgeas eos iterata Coniuratione, donec obediant. Sunt enim aliquantulum pigri, & non libenter veniunt inter homines, sicut prædiximus. Malgaradas apro chameron asoty mesary throes Zamedo sogreal paredon adre Caphoron onatyr tirno beosy. Cha merõ phorsy mellon tedrumarsy dumaso duise Casmiel elthurnpeson alproys fabelronty Sturno panalmo nador. Dorothiel cusi feor madylon busar pamersy chear ianothym baony Camersy vlymeor peathã adial cadumyr renear thubra Cohagier maslon Lodierno sabelrusyn. Dorothiel onear chameron vlyfeor madusyn peony oriel nayr druse mouayr pamerson etro dumeson, dauor caho. Casmiel hayrno, fabelrunthon. Completo carmine isto si moram fecerit spiritus in veniendo; iterum legat vsque tertio: & sine omni dubio visibilis apparebit, & reuelabit ad aurem commissa. Vsiel parnothiel chameron briosy sthrubal brionear Caron sotronthi egypia odiel Chelorsy mear Chadusy notiel ornych turbelsi paneras thorthay pean adresmo boma arnotiel Chelmodyn drusarloy sodiuiel Carson, eltrae myre notiel mesraym Venea dublearsy mauear melusyron chartulneas fabelmerusyn. Vsiel asoyr paremon cruato madusyn sauepy mauayr realdo chameron ilco paneras thurmo peã elsoty fabelrusyn iltras charson frymasto chelmodyn. Cabariel onear chameron fruani, parnaton fofiel bryosi nagreal fabelrontyn adiel thortay nofruau pena afefiel chusy. Completo carmine, si fuerit in die, statim aderit spiritus vocatus sine mora. Si aute~ fuerit in nocte & moram fecerit in veniendo spiritus quem vocasti: totiens vrgeas eum, doneo veniat per repetitionem Carminis, quod valde reuereri solent. Cabariel afiar paremon chiltan amedyn sayr pemadon chulty mouayr sauepor peatha mal frimaston dayr pean cothurno fabelrusyn elsoty chelmodyn. Hoc carmine dicto versus Circium, angelus statim apparebit visibilis, reserans illi commissum arcanu~; referetque tibi, si quid ille commiserit. Raysiel afruano chameron fofiel onear Vemabi parnothon fruano Caspiel fufre bedarym bulifeor pean Curmaby Layr Vaymeor pesarym adorcus odiel Vernabi peatha darsum laspheno deuior Camedonton phorsy lasbenay to charmon druson olnays, Venouym lulefin, peorso fabelrontos thurno. Calephoy Vem, nabelron bural thorasyn charnoty Capelron. Raysiel myltran, fruano fiar chasmy clymarso pean Sayr pultho chulthusa medon vepursandly tusan axeyr afflon. Symiel myrno chamerony theor pasrõ adiueal fanerosthi sofear Carmedõ Charnothiel peasor sositran fabelrusy thyrno pamerosy trelno chabelron chymo churmabõ, asiel, peasor carmes nabeyros toys Camalthonty. Symiel marlos chameron pyrcohi pean fruary fabelronti gaelto siargoti melaflor hialbra penor olefy Aiulbrani ordu Casmeron omer vemabon. Armadiel marbeuo pelrusan neor chamyn aldron pemarson Cathornaor pean lyburmy Caueron Tharty abesmeron vear larso charnoty theor Caueos myat drupas Camedortys ly pa ruffes ernoty mesoryn elthi chaor atiel; lamesayn rouemu fabel rusin, friatochasalon pheor thamorny mesardiel pelusy madiel baseroty sarreon prolsoyr asenosy cameltruson. Armadiel afran meson Casayr pelodyn, Cauoti chameron thersoruy marbeuon pheor Casoyn myruosy lyburmy deon fabelronton. Chubis archmarson. Baruchas maluear chemorsyn charnotiel bason ianocri medusyn aprilty casmyrõ sayr pean cauoty medason peroel chamyrsyn cherdiel auenos nosear penaõ sayr chauelontr genayr pamelronfrilcha madyrion onetiel fabelronthos. Baruchas Mularchas chameron notiel pedarsy phroys lamasay myar chalemon phorsy fabelrontho theras capean Vear almonym lierno medusan therfiel peatha thumar nerosyn cral nothiel peson segalry madon scoha bulayr. Carnesiel aphroys chemeryn mear aposyn. Layr peã noema ouearma sere cralty caleuo thorteam chamerõ ianoar pe lyn Layr, baduson iesy melros ionatiel delassar rodiuial meron sau ean fabelron clumarsy preos throen benarys sauean demosynon laernoty chamedonton. Carnesiel aproysi chamerõ to pemalroyn phroys Cadur mearmol benadron Vioniel saviron army pean arnotiel fabelronthusyn throe chabelron sauenear medaloys vear olmenadab cralty sayr. Caspiel aloyr chameron noeres padyr diuiel prolsyn vear maduson cralnoti fruon phorsy larsonthon thiano pemarson theor. Caueos adeueos friato briosi panyeldrubon madiel sayr fabelrusyn gonear pean noty nabusran. Amenadiel aprolsy chameronta nosroy throen mesro salayr chemaros noe pean larsy freueon ionatiel pelroyn rathroy Caser malusan pedon Cranochyran daboy seor marchosyn lauo pedar venoti gesroy phernotiel Cabron. Amenadiel bulurym chameroty eriscoha pedarmon flusro pean tuarbiel fabelrõ greos belor malgoty nabarym stilco melros fuar pelaryso chitron amanacason. Demoriel onear dabursoy Cohyne chamerson ymeor pean olayr chelrusys noeles schemlaryn venodru patron myselro chadarbon veuaon maferos ratigiel personay lodiol camedon nasiel fabelmerusin sosiel chamarcchoysyn. Demoriel osayr chameron chulty saue porean lusin dayr pean cathurmo fomarson ersoty lamedon iothar busraym fuar, menadroy chilarso fabelmerusyn. Geradiel onayr bulesar modran pedarbon sazeuo nabor vielis proyn therdial masre reneal Chemarson cuhadiam almona saelry penoyr sarodial chramel nadiarsi thorays Vayr pean esridiel cubal draony myar dearsy colludarsy memador atotiel Cumalym drasnodiar parmy sosiel almenarys satiel chulty dealny peson duarsy cuber fruony maroy futiel, fabel merusi venodran pralso lusior lamedõ fyuaro larboys theory malrosyn. Geradiel osayl chamerusin chulti pemarsoniel dayr fayr chaturmo les bornatyn ersoty camylor sayr fabelmerodan cosry damerson maltey nabelmerusyn. Buriel mastfoyr chamerusyn, noel peam Ionachym mardusan philarsij, pedarym estlis carmoy boycharonti phroys fabelronti, mear Laphany vearchas, clareson, notiel, pador aslotiel, marsyno reneas, Capedon, thisinasion melro, lauair carpentor, thurneam camelrosyn. Bvriel, Thresoy chamerontis, hayr plassu, marso, neany, pean, sayr. fabelron, chaturmo, melros, ersoty caduberosyn. Hydriel, apron chamerote, satrus pean néarmy chabelon, vearchas, belta, nothelmy phameron, arsoy pedaryn onzel, Lamedo drubel areon veatly cabyn & noty maleros haytny pesary does, pen rasi medusan ilcohi person. Hydriel omar, penadon epyrma narsoy greol fabelrusin adiel pedrusij nozeui melrays vremy peã larfoy naes chemerotyn. Pyrichiel marfoys chameron, nael peanos pury lames iamene famerusyn mearlo canorson theory torsa, nealthis dilumeris maphroy carsul ameor thubra phorsotiel chrebonos aray pemalon layr toyfi vadiniel nemor roseuarsy cabti phroys amenada machyr fabelronthis, poyl carepon vemij naslotyn. Pyrichiel osayr Chamerosy culty mesano dayr fabelron cathurmo pean ersoty meor iathor cabon Frilastro melrusy. Emoniel aproisi chamerusyn thulnear peanos meuear, pandroy cralnotiel narboy mauy fabelrontos, arliel chemorsyn nety pransobyr diuiel malros ruelty person roab chrumelrusyn. Emoniel lebos chamerothy meor pemorsy dyor medulorsyn fraypeam, Crymarsy melrosyne vari chabaryn dayr. Aschre cathurmo fabelron ersoty marduse. Icosiel aphorsi chamersyn thulneas ianotiel menear peanos erasnotiel medusan matory fabelron ersonial cathurmos laernoty besrayn alphayr lamedonti nael cabelron. Icosiel osayr penarizo chulti meradym phrael melchusy dayr pean cathurmo fabelron ersoti chamerusan iltham pedaly fuar melrosyn crymarsy phroyson. Soleuiel marfoy chamerusyn oniel dabry diuiel pean vear, lasmyn cralmoty pedaros drumes, pean vear chameron loes madur noty basray erxo nadrus peliel thabron thyrso ianothin vear perasy loes pean nothyr fabelron bauesy drameron eschiran pumelon meor dabrios crimorsiel penyvear nameroy lyernoti pralsones. Soleuiel curtiel chamerusyn saty pemalros dayr ianothy cathurmo parmoy iotran lamedon frascu penoy ilthon fabelmerusyn. Menadiel marfoy peanos onael chamerusyn theor ianothy ofayr melros tudayr penorsyn sachul tarno roseuas peathã asiel morfoy maplear casmyron storeal marpenu nosayr pelno dan layr thubra elnodion carsephy drumos fabelmerusyn andu pean, purays calbyn nachir loes philuemy casaner. Menadyel murty chamerose dayr pean cathurmo phameron ersoti pray saruepo, fabel metij rean, charon ietlas Meduse fayr lamerosyn alty merchahon. Macariel myrno chamerosy purmy maresyn amos peanam olradu, chabor ianoes fabelron dearsy chadon vlyses Almos rutiel pedaron deabry madero neas lamero dearsy, thubra dorpilto melrosyne draor chalmea near, parmõ dearsy charõ alnodiel parsa radean, maroy reneas charso gnole, melrosin te dranso casmar ebroset. Landrys masfayr therasonte noel amalan. Macariel osayr chamerose chulti pesano dayr fameron; cathurmo pean ersoty lamedon so uapor casrea mafyr. Ianos tharfia, peathan non acri pean etion matramy. Vriel marfoys lamedonti noes, chameron, anducbarpean phusciel arsmony tuerchoy iamersyn nairiel penos raseon loes vear fabelruso cralty layr parlis meraij mear, thubra aslotiel dubyr reanu nauosti masliel pedonyto chemarphin. Vriel Aflan pemason cosayr chameron, chulty fabelmerõ deyr pean, cathurmo merosyn ersoti chalmon sauepo Meduse rean lamerosyn. Bydiel maslo chameron theory madias near fabelron thiamy marfoy vear pean liernoty calmea drules: Thubra pleory malresa teorty melchoy vemo chosray. What about the Ars Goetia (part I of Lesser Key of Solomon) and Steganographia? Wikipedia (And the many sites that copy it) says they are related as well, but all I can find is the connections you show here, which is the second part of the Lesser Key of Solomon. I don’t know what comparison you talk about, but the Ars Goetia has different names alltogether. Bael, Agares, Vassago, Camigin, Marbas, etc., etc. Nothing like the table above. You might want to get the book so you can check for yourself. but are the airiel spirits like emeperor carnesiel have the same or even more?